The buzz about NVMe has recently reached a fever pitch, and rightfully so. It’s the perfect technology buzz word – a nice little acronym that blends the right amount of nerdy and cool and promises to change the landscape of storage forever. Who wouldn’t want to talk about that? But as we’ve discussed before, it is important to understand that NVMe is more than simply putting a fancy new interface on the same old flash drives. 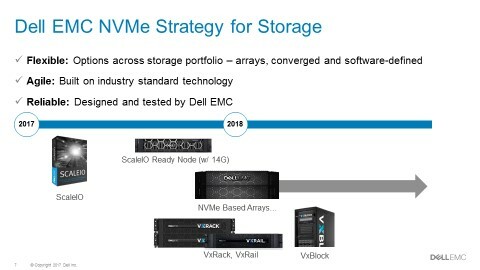 As one of the pioneers of NVMe, Dell EMC couldn’t be happier that the world is building with anticipation that NVMe is finally coming to fruition in mainstream enterprise storage. 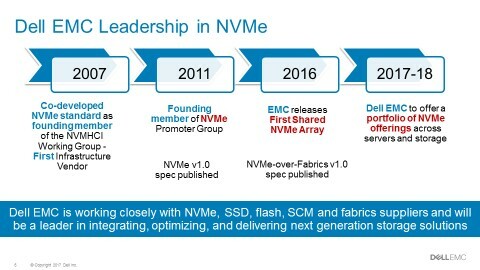 When I say pioneer, I mean that literally – Dell EMC co-developed the NVMe standard starting back in 2007 and by the end of the year, we’ll release our next NVMe array, which will be the first of many in our mainstream all flash portfolio. NVMe is an interface, which replaces SAS/SATA to overcome the limitations of these protocols that were designed over 30 years ago for spinning hard disk drives, and thereby take advantage of the parallelism of modern CPUs and SSDs. NVMe is NOT media, which in the short term is NAND-based flash, and is the same media that vendors have been shipping in all-flash arrays for years. NVMe will enable a modest improvement in latency but at a premium price. 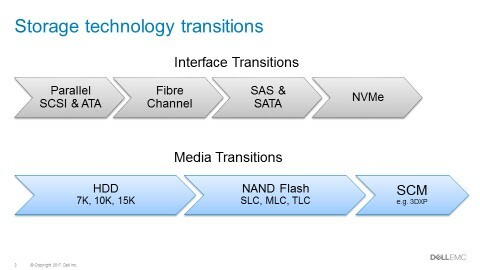 NVMe will, in the future, open up high-speed, low-latency access to the next generation storage media called Storage Class Memory, or SCM, (for example, 3D XPoint). And that’s where things get interesting. SCM will dramatically improve latency over NAND-based flash media, just as NAND-based flash dramatically improved latency over spinning disk media. In other words, SCM is Emerald City and NVMe is the yellow brick road – the game-changer in storage will be the combination of NVMe and SCM – not NVMe alone. What benefits does the FlashArray //X have beyond unspecified performance over their last generation array? What performance will you really get from it, and does it justify the premium? Given their proprietary approach, what is the go-forward path to SCM and when will that come? The proprietary road is littered with failure. See Violin Memory as a recent example. We recently evolved our NVMe strategy based on customer feedback and are now focused on continuing to deliver NVMe across our portfolio over the next 6 to 24 months. In fact, we’ll launch our first “mainstream” NVMe array by the end of the year. Unlike Pure Storage, we are leveraging industry-standard technology and collaborating with industry leaders like Intel to ensure our offerings are ready for enterprise requirements, while also minimizing price premiums for early adopters. In addition, this approach allows us to accelerate and optimize delivery of the ideal enterprise-ready Storage Class Memory (SCM) devices as soon as they become available. Dell EMC also continues to lead the industry in driving standards in NVMe with our cutting-edge portfolio of PowerEdge servers. We will offer NVMe in a variety of consumption models for storage including arrays, software-defined storage, converged and hyper-converged infrastructure solutions. As always, they will be backed by Dell EMC’s world-class engineering, services and support organizations – who have been designing and testing solutions for mission critical environments for decades.